This post is the copy of the one posted on Kialo. Let’s convert a seemingly useless debatable www.Kialo.com tool into a functional instrument for political organizing. You don’t ask a question the answer to which will not make any difference on you. When you start a debate, all you do is separating people on who are agree and who are disagree with you. And? Nothing (well, nice mental exercise; sharpening your own arguments). However, if you find MANY people who think like you are, and you have a mutual goal, you can join your forces! All you need is a clear goal! I have a clear goal. I am going to lay out my goal and my vision why should we do it. But I need to say upfront – don’t start the debate about the goal! If you don’t believe that the goal is right or achievable, just leave. Don’t waste yours and our time – go and create your own action group. If you believe in the goal, THEN we can discuss HOW to achieve it, what to do, what steps to make. The goal is taking over the Congress. It is NOT a crazy idea. It is well calculated and achievable goal – but only in the current political environment! The division in the Senate is almost 50 – 50. If we could elect a small group of 4 or 5 independents (or at least not Republicans and not Democrats) that group would rule the Senate, meaning it would rule the Country. Because without their vote nothing could happen! In order to achieve this goal in this year, in every State a viable non-democratic and non-republican candidate has to run for a Senate seat. To run such a campaign, we need an organization: the 3D Force (since it is not a party - yet?). Ideally, if the organization becomes strong enough, its candidates need to run in ALL possible elections. Naturally, only a few will win. But it is only the reason for running as many as possible! Taking over the Congress is the ultimate goal. But if that will not be feasible in this year, the next best goal which should be on the table is kicking the Republicans out of the Congress (and everywhere else). This how it can be done. 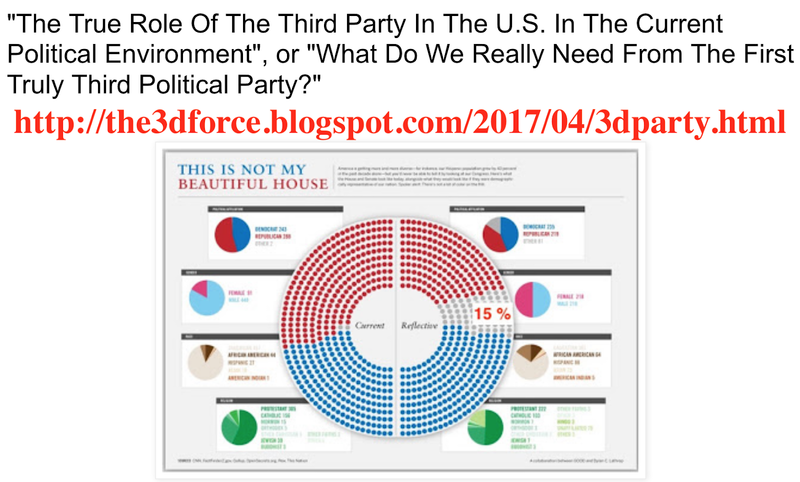 Our 3d-Force candidate will run against a Republican and a Democrat. In a case when our candidate has a clear lead, it is our clear win (and with the good organization and the correct ideology that will happen!). But sometimes it will be a coin toss between a Republican and a Democrat. In that case three weeks before the election day our candidate will leave the race asking all the supporters to vote for the Democrat (the lesser of the two evils). Even that tactic alone will give the power to the 3D- Force. I have been writing on the matter (see the links below). It is important to all us to find a common view on the current political events and what had led to them. That is why I encourage everyone to read what I wrote, and to write your own thoughts on that matter. As long as we agree on the goals, the debate about politics and social and economic roots of it will be only helpful. The Bolshevik revolution in Russia started from reading Das Kapital. Equipped with that ideology top Bolsheviks were able to lead the masses. The 3D Force ideology is in its infant state. I am not a professional politolog/politologue or organizer. All I have so far is a vision and a goal. That is why I created this campaign – to find the like.